Looking to trade snow banks for sand dunes? Escape the winter chill and soak up the sun in the coastal city of Long Beach, California. Nestled along the Pacific Coast just 20 miles south of Los Angeles, Long Beach is home to many thriving districts, the East Village Arts District, brimming with galleries, coffee houses and eateries, to the charming seaside community of Belmont Shore where you can find a number of family-owned boutiques, restaurants and businesses. Steps away from the coastal town sit miles of beaches, perfect for families or sunbathers seeking relaxation and solitude. Adventure seekers will appreciate Long Beach’s endless array of recreational outdoor and water-sport activities. From bike stations to various paths, avid cyclists will find enjoyment in one of the nation’s most bike-friendly cities. Water sport enthusiasts will delight in aqua-activities such as hydro-biking, stand-up paddle boarding, and kayaking. Sightseers can enjoy whale watching year-round, exploring the coast on a cruise, sailing or power boating. 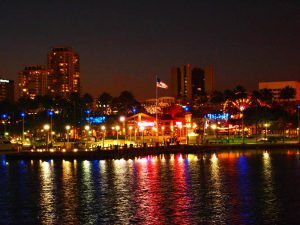 With just enough options for everyone, Long Beach is the perfect warm winter getaway. Ranked as one of the most bike-friendly cities in the nation, Long Beach is the perfect location for cyclists to escape the cold. Whether biking alone or with family or friends, Long Beach offers a multitude of amenities for bikers while they bask in the warm rays of California sunshine. Long Beach is the ideal place for some R&R. Its warm winter winds and sunny skies are the perfect conditions for some offshore sight seeing and boating.